CryLaS designs and manufactures diode-pumped solid-state lasers in UV, VIS and IR for scientific and OEM-use. Applications in industries such as biotechnology, analytics, imaging, sensor systems and micromachining benefit from the long term stability, low noise and small size of our products. CryLaS is a recognized OEM supplier of UV and Deep UV Microchip lasers for 24/7 applications. Introducing the FQCW-266-10-C. Compared to other FQCW266 series models, the laser head is roughly half the size, and nearly 70 percent lighter. Improved conversion efficiency lowers maximum power consumption to 70W. This compact new model is an ideal and cost effective solution for applications such as spectroscopy, inspection, analytics, mastering and 3D printing. 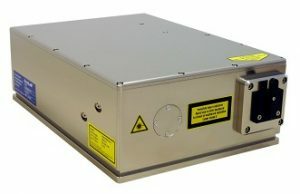 The DPSS CW deep UV Laser series FQCW-266 comes with a resonant frequency conversion stage, emitting a fixed wavelength of 266nm. The laser head is contained in a sealed aluminium housing, which allows operation in a wide range of environmental conditions. Heat removal from the laser head is done by air convection, no other provisions (chiller, fan etc.) are needed. High quality passively Q-switched pulsed laser systems emitting wavelengths of 213 nm, 266 nm, 355 nm, 532 nm and 1064 nm for use in both OEM and scientific research. Applications include biotechnology, analytics, imaging, spectroscopy, sensor systems, micro-machining and LIDAR. © 2017 CryLaS. All Rights Reserved.